First of all, I don't put people on food stamps. People become eligible for food stamps. Second of all, the initial expansion of food-stamp eligibility happened under my Republican predecessor, not under me. Number three, when you have a disastrous economic crash that results in 8 million people losing their jobs, more people are going to need more support from government. One major change in food stamp rules -- in the direction of more generosity -- occurred with the 2009 "stimulus" law, which has President Obama's signature, not Bush's. On May 15, the House and Senate passed the bill, but President Bush issued a veto on May 21. The House voted to overturn the president's veto shortly thereafter, and with the margins by which the bill was passed, a Senate override also occurred; so the Congress overrode the president's veto, passing the bill into law (Public Law 110-234, the Food and Energy Security Act of 2007). However, the veto override was moot, as a 34-page section of the bill was omitted in the version sent to the White House. In effect, the President vetoed a bill Congress never considered. The bill had to be re-passed by Congress. The House passed the Farm Bill again on May 22, and the Senate shortly thereafter. President Bush again vetoed the measure, but this veto was overridden in both Houses on June 18, so the Farm Bill in its entirety became law. In summary, Bush vetoed that law twice. Meanwhile, Obama was a U.S. Senator in 2008. Senator Obama had THREE chances to vote against it, but he never did (he abstained all three times). Finally, President Obama's Agriculture Department has been remarkably complicit, if not wholeheartedly enthusiastic, with the states', since inauguration day, using the rules from the 2002 and 2008 Farm bills to soak the U.S. taxpayer. Some, but very little, of the increase in food stamp spending can be attributed to the recession or any other factor pushing people into poverty. It's all about the program's getting more generous. Whether expanding the food stamp program is "good" or "bad" is a different matter. President Obama deserves some of the credit or blame for those expansions; President Bush deserves none. [Technical note. One of the provisions of the 2008 Farm Bill, and of the 2009 stimulus law, was to sharply increase what the USDA calls the "maximum benefit." This provision alone expands eligibility and participation, because the maximum benefit determines the amount of income over which food stamp benefits are fully phased out: a larger maximum means that incomes that would be assigned little or no benefit are suddenly assigned a significant benefit. That's part of the reason why the average income of people receiving food stamps actually INCREASED between 2007 and 2010 (see Table A.27 here). The provision also encourages states to do their part to expand eligibility. Thanks to the recession, and changes in program rules, a large fraction of households receive government assistance, especially those headed by people without a four-year college degree. The three largest government safety net programs serving nonelderly households are Medicaid, unemployment insurance and the Supplemental Nutrition Assistance Program (SNAP). Together they paid out more than $600 billion in benefits during 2010 on behalf of program participants. A large number of households received these benefits. Using the results of the Census Bureau’s annual demographic survey, I classified nonelderly households by the educational attainment of the household head (I omitted the small number of households headed by people younger than age 25, because their educations might still be in progress), and calculated the fraction of them that received Medicaid, unemployment insurance and/or SNAP sometime during the years 2007 and 2010. A few households headed by people with a four-year college degree or more received at least one of these three forms of government assistance, but their recipiency rates were much less than the rates among less educated households. Less than 10 percent of households headed by someone with a doctorate or professional degree (like an M.D. or law degree) received government assistance. 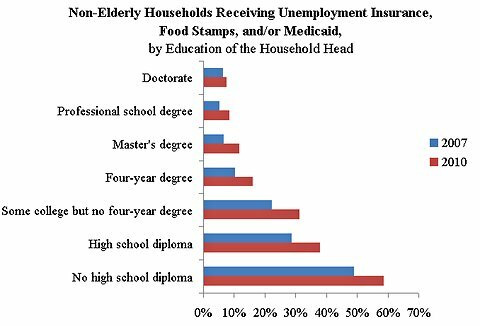 Over a third of households with heads whose formal education was limited to a high school diploma — the most common type of household — received at least one of these types of assistance in 2010. A majority of households with heads who stopped their schooling before graduating from high school received government assistance in 2010. All of the groups saw the likelihood of government assistance increase between 2007 and 2010. Some of this increase, especially with the Medicaid program, can be attributed to the recession because Medicaid eligibility rules hardly changed during that time. At the same time, a number of people, especially in the less educated categories, saw their incomes fall below the poverty line, which makes Medicaid eligibility much more likely. But changes in the rules for taking part in unemployment insurance and SNAP changed significantly during this time, and explain a large part of the changes between 2007 and 2010 shown in the chart. We can hope that an economic expansion will take incomes back to where they were before the recession began, and beyond. But government assistance will not return to prerecession levels until participation rules do, and that return depends on political factors as much as economic ones. My blog entry today explains how the number of SNAP households -- Washingtonspeak for number of families receiving food stamps from the federal government -- has exploded in recent years because states have helped rewrite the eligibility rules. Specifically, most states have eliminated asset tests. You can own a yacht and now receive food stamps (a yacht is better than stocks or bonds, because the latter will spin off income that could make you ineligible for food stamps). Aside from low income, even if it is just temporarily low, all you need is one of the states' brochures. For example, if you live in Connecticut, you need the "Helping People in Need" brochure and you are eligible for food stamps. (Actually, you don't need to possess such a brochure, you just need to have been deemed eligible by the state to have received one -- see p. 65 of this document, which means that the state understands your income to be at least temporarily below 150 percent of the poverty line or so). You do not need to be receiving, or eligible for, cash from any other welfare program. I understand that you find the above difficult to believe. A brochure? That's it? Really?! (TANF is the cash family assistance program. Not too long ago food stamps and TANF were tied together -- if you got cash from TANF you probably would get food stamps too. The TANF language is a legacy of that connection). Here is a Colorado state congressman explaining how it really is a free lunch from the states' points of view. The federal government pays for half of the brochure, and some states like Colorado even convince charities to help with the other half! One myth about the surge in federal government spending over the last four years is that it was an automatic response to the recession. But the “tests” that beneficiaries of various government safety-net programs are required to pass before they can participate have gotten easier since 2007. The government safety net is intended to help people in need. Because a lot of people don’t need the government’s help, a variety of tests have been designed to distinguish the needy from everybody else. These include employment tests, asset tests, income tests, earnings tests, retirement tests and age tests. Two of the largest government programs are Social Security and Medicare. They administer essentially one test, for age. Once a person reaches age 65 (sometimes earlier), he or she can receive benefits from these programs regardless of income, assets or employment status. In the past, and still today in most of Europe, Social Security required beneficiaries not only to be elderly but to be retired – the retirement test. These days unemployment insurance is another major government expenditure, and its beneficiaries have to pass an employment test. That is, they have to be without a job and actively looking for one in order to receive benefits (a few states have small programs for employed but underemployed workers). Once a person passes the employment test, his or her assets or financial income are irrelevant for determining eligibility or benefits. Beginning in the 1990s, cash family assistance or “welfare” programs began to have their own employment tests, but with the opposite determination: employment was required for participation. The 2009 American Reinvestment and Recovery Act permitted states to relax some of these requirements. Family assistance programs traditionally had asset and income tests: a family could qualify only if both its income and assets were low enough. Medicaid – a government-financed health-insurance program for the poor – also has asset and income tests. The Patient Protection and Affordable Care Act of 2010 relaxed some income tests effective 2014, although even then a family with too much income will not qualify for Medicaid. Traditionally the food stamp program (now called the Supplemental Nutrition Assistance Program, or SNAP, and participants now receive debit cards from the Department of Agriculture, rather than “stamps”) overlapped closely with family assistance programs, with some of the same asset and income tests. The 2002 farm bill provided an opportunity to avoid some of the SNAP tests, and states have recently taken that opportunity. The bill allowed states to confer automatic SNAP eligibility on all households receiving a specified social service informational brochure, hard as that may be to believe. Households that participate in SNAP under this “broad-based categorical eligibility” rule still have benefits determined by the same formula (of household size and net income) as the other SNAP beneficiaries. A practical result of broad-based categorical eligibility is that households can receive benefits based solely on their net income – it typically must be less than 130 percent of federal poverty guidelines (about $20,000 a year for a family of four) – and not based on the value of their assets or their employment status. Even SNAP households not taking part through broad-based categorical eligibility saw the asset test relaxed by the 2008 farm bill, as the values of vehicles, retirement accounts and education savings accounts began to be excluded from the test. So, simply put, in most states having assets is no longer a barrier to receiving food stamps. That’s the main reason that participation in the program increased 37 percent more than the number of families with income near or below the poverty line. I agree that safety net programs would have grown from the recession alone, but, for better or for worse, they have grown many times beyond that thanks to numerous changes in program rules. While Americans discuss the duration of unemployment benefits in terms of weeks, Europeans discuss them in terms of months and, sometimes, years. A few countries even pay unemployment benefits indefinitely, in some circumstances. Unemployment insurance offers funds, for a limited eligibility period (in the United States, now up to 99 weeks) to “covered” people who lost their jobs and have not yet been unable to find and start a new job. In last week’s post, I showed that the United States, for at least 50 years, has never offered unemployment benefits for so long as it does now. For the 50 years prior to December 2008, the maximum unemployment benefit period was 72 weeks during the 1992 recession. In the severe 1981-82 recession, the benefit period was much less, 55 weeks. This historical perspective may indicate that 99 weeks is long enough, or maybe even too long. However, international comparisons tell the opposite story. 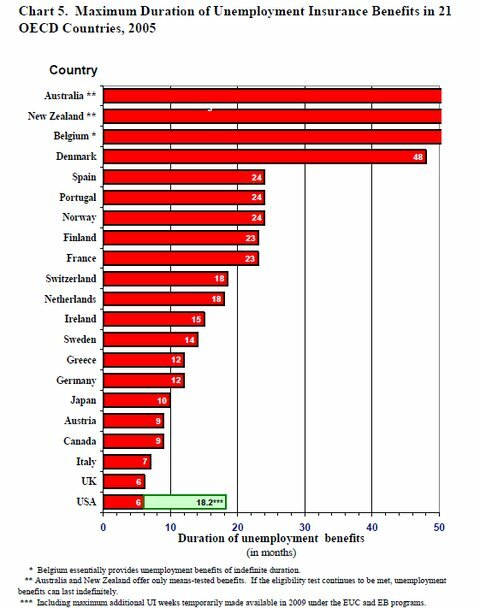 The chart from 2009 Congressional testimony by Gary Burtless below compares the maximum duration of unemployment insurance benefits in 21 nations of the Organization for Economic Cooperation and Development, as of 2005, measured in months. The United States had the shortest duration of the 21 countries, six months. By 2009, when Mr. Burtless testified, the United States had increased its benefit period and would increase it still after that; he did not have 2009 data on the other countries. Organization for Economic Cooperation and Development, “Benefits and Wages,” 2007. Even in 2005, before the world financial crisis, many countries had unemployment benefits that lasted 18 months or more. Three countries offered benefits indefinitely, in some situations. By European standards, our 99 weeks appears too short. Part of the reason that countries can disagree so much on the benefit period is that long periods have both costs and benefits. A longer benefit period makes it more difficult to get people back to work, because they are getting paid for not working. But for the relatively small fraction of people who cannot find a job even after looking for several years, the government benefits help cushion lives that can be very difficult. Moreover, the aggregate consequences of a long benefit period may not be all that large, because a only small fraction of people are unemployed long enough for it to matter whether the benefit period is 99 weeks or 199 weeks. At the end of 2010, for example, when unemployment in the United States was quite high, only about 2 percent of the unemployed had been unemployed more than 25 months, let alone 50 months. For the same reason, it makes a lot bigger difference if benefits last 12 months rather than six, because about half of the unemployed have been unemployed more than six months. We know that long-lasting unemployment benefits have the cost of less employment and the benefit of more safety. But we still don’t know the optimal mix of the two. With Unemployment Insurance, Is 99 Weeks the Magic Number? A possible compromise between Democrats who want to leave the unemployment compensation system unchanged and Republicans who want to return to pre-recession benefit formulas might be to adopt a benefit formula from some of the previous recessions. At the end of 2011, Congress allowed unemployment beneficiaries to continue to collect under both the emergency and extended programs, which permit the unemployed to receive benefits for up to 99 weeks of unemployment. Some economists believe that unemployment insurance stimulates spending because unemployed people are thought to spend most, if not all, of the money they have on hand. Some economists also suggest that unemployment insurance prolongs unemployment because an unemployed person has to give up his benefits as soon as he finds and starts a new job or returns to working at his previous job. Either way, some people cannot find work, and unemployment benefits help cushion their blow. The ideal amount of time to permit the unemployed to collect benefits is a trade-off between the insurance the program provides and the unintended work disincentives it creates. For now, our government has decided that 99 weeks is the ideal time (92 in many states, and a bit less in others). 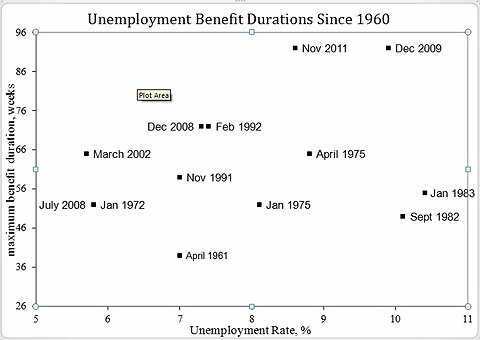 The maximum duration of benefits was much less in previous recessions. I examined the 12 episodes since 1960 when Congress increased the amount of time the unemployed could receive benefits, together with the most recent month with unemployment data (November 2011). The vertical axis in the scatter diagram measures the maximum amount of time that the unemployed could receive benefits for each of the 12 law changes. The most recent law change was December 2009, when regular state and federal emergency and extended benefits could last up to 92 weeks (for comparability across recessions, here I ignore the few states that add seven additional weeks of extended benefits, bringing the total to 99). We reached 92 weeks in a couple of steps. In July 2008, benefits began to last 52 weeks. Later that year, the maximum benefit duration was lengthened to 72 weeks. In the 50 years before December 2008, the maximum benefit period was 72 weeks during the 1992 recession. Benefits lasted up to 65 weeks in the 2001-2 and 1975 recessions. The horizontal axis graphs the unemployment rate at the time that unemployment insurance legislation was changed. Since 1960, only in the 1982 recession did the unemployment rate get so high. Nevertheless, unemployment benefits in that recession lasted at most 55 weeks – about three-fifths of the time that unemployment benefits last today. Since the December 2009 law change, the unemployment rate has fallen, although nowhere near back to normal. With the recession officially ended almost three years ago, today’s unemployment rate is still similar to that in 1975 – one of the more severe recessions of the past. Still, when the unemployment rate was almost 9 percent in spring 1975, Congress decided to limit unemployment benefits to 65 weeks. These comparisons may suggest that continuing or terminating emergency and extended unemployment benefits are not the only policy choices. The programs could be continued but perhaps with a lesser duration, such as 52 or 65 weeks as in previous severe recessions.